Just when you thought 2010 was filled with enough completely useless things (the iPad, the Northern Line, Gordon Brown), Sony has decided enough is enough and decided to scrap producing floppy disks. According to the BBC, Sony still manufacture them and ship them by their millions. The rest of the market has long since gone off the floppy, with Apple abandoning them in 1998 and Dell following suit in 2003. Despite this, Sony’s decision will not come into effect until March next year. But who is it that’s still using them? My laptop can’t read one, and I can’t remember the last scenario in which I needed less than 1.44MB of storage space. I can remember my first use of a floppy disk though, with much fondness. My brother returned from university for the summer in 1995, with a pirated copy of Championship Manager 1994/95 (Italia edition), which was spread over four separate disks. So retro is this game that I can’t even find it on eBay! Disks have long since passed into retro chic; these earrings would hardly look out of place in Hoxton, or on the set of Nathan Barley. However, it’s hard to imagine floppies garnering the same kind of fond nostalgia as music geeks reserve for vinyl. Perhaps it’s because techie geeks are so innately addicted to the new, whereas musos tend to live in the past. Nonetheless, I’d be interested to hear your recollections – when is the last/first time you used a floppy disk? Will you be at all sad to see them go? 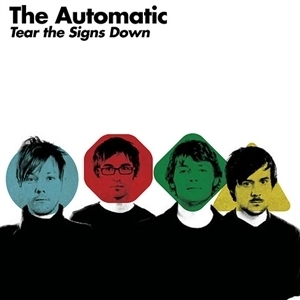 You may remember The Automatic from such pop-rock atrocities as (what’s that coming over the hill is it a) Monster (?) and (let’s go see) Raoul, which plagued the airwaves in 2006. Since then, however, the band have undergone a major transformation with the unceremonious ditching of keyboardist/screamer Alex Pennie and the recruitment of alt-rock pioneer Paul Mullen (formerly of yourcodenameis:milo).